A high-voltage extension cord is a necessary piece of equipment that every RV needs to have. Whether you’re adventuring around the country or just parking in the driveway, you need a reliable source of power for your RV while it’s parked. To help you find a first-rate extension cord, we have put together a list of attributes to look for when choosing a cord. The most crucial criteria you have to determine is if the extension cord is technically capable of handling the electrical needs of your RV. Using an insufficiently suited extension cord can result in your RV losing power and, in extreme cases, could cause permanent damage to your appliances. Amp Rating - RV extension cords commonly come in 30 and 50 amp rated versions. If you’re unsure it is always safer to go with a higher amp rating. 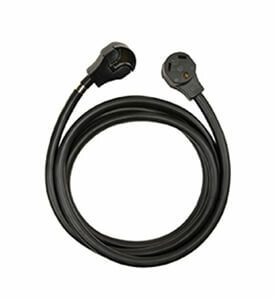 Gauge Size - Standard extension cords are too skinny to handle the power needed in your motorhome. RV extension cords are thicker so they can withstand the high voltage power. RV Extension Cords are exposed freezing and sweltering temperatures, rain, snow and jagged concrete. They are constantly being moved, tugged on and bent at extreme angles. A rugged construction is essential for an RV extension cord to stand up to these extreme conditions. Thermoplastic Cable Jacket - The outer protection of a cord must be able to withstand heat, cold and abrasions. Sturdy Handles - Extension cords are stressed every time they are pulled out of a socket. A thick handle over the end of the cord makes it easier to grip and reduces the likelihood of damaging the wiring when it is pulled out. Our online store has dozens of high-quality RV extension cords of every length and amperage rating. Find one today and ensure your RV is always supplied with the power you need.